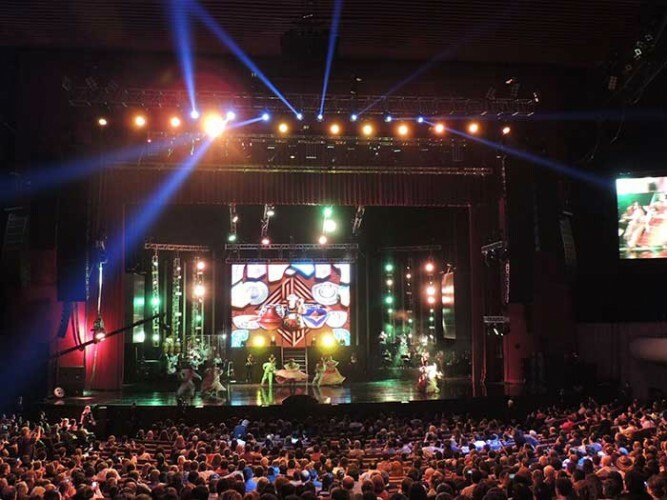 Columbian born singer Margarita, La Diosa de la Cumbia staged a special sold-out show at the 10,000 capacity Auditorio Nacional in Mexico City, with lighting designed by Ángel Alvarado and a rig that included Robe MMX Spots, LEDWash 1200s, LEDWash 600s and LEDBeam 100s - all from the ROBIN series - together with ColorWash 2500E ATs. The delighted crowd danced to the contagious rhythms of Margarita’s songs for two and a half hours, turning the experience into a real high energy Friday night party! Ángel Alvarado - only 18 years old but already with expansive technical knowledge and experience - is a new member of the artist’s technical team. For this show, he utilised 20 ROBIN MMX Spots, 18 LEDWash 1200s, 12 LEDWash 600s and 28 LEDBeam 100s plus 12 ColorWash 2500E ATs, which he programmed and operated using a grandMA2 light console. The full technical production for the show was supplied by Mexico-based Tama Producciones, which owns most of the lighting fixtures. He has been using Robe products around six months in various music projects and has always been impressed. Fourteen LEDBeam 100s and six LEDWash 600s were distributed right and left of the main upstage LED screen. On the back wall, floor and above the LED screen were six MMX Spots in each position. Overhead were ten LEDWash 1200s on four trusses. Around the proscenium were four LEDWash 1200s and four MMX Spots per side, and last but not least, all the ColorWash 2500s were on a truss just downstage of the prosc. José Alberto García Ramírez, lighting sales engineer at Vari Internacional, Robe’s Mexican distributor, was present during the set-up and show, together with the regular staff of the Auditorio. José Alberto García Ramírez, lighting sales engineer from Robe’s Mexican distributor Vari Internacional and Mario Alberto Flores, in charge of Robe technical service at the company were present during the set-up and show. José Luis Lozano, purchasing manager at Tama Producciones - in which Margarita and Alejandro are also partners – said: “We have an excellent relationship with Vari and always get positive feedback about them and the Robe units. The technical spec of the lights is amazing and Vari’s support invaluable”. This performance also marked the launch of Margarita’s new album ‘Desde Mis Raìces’, the start of a new tour plus the launch of her son Jonathan’s solo career after being part of Margarita’s chorus for the last two years and an active music producer. With 16 musicians, four chorus and 17 dancers onstage it was a busy show! There was also a special appearance by Samuel “Samo” Parra ex member of Mexican group Camila and it was recorded by local TV channel Televisa for broadcast later. An eclectic mix of different fusions between Colombian cumbia and other modern music have enthralled audiences for over 30 years... turning each Margarita show into a colourful, happy and 'dance-tastic' party. The look and production of the show has been instrumental in helping achieve this important connection with the live audience. Margarita’s production has been in constant development and evolution throughout her incredible career, with the addition of more musicians, ballet and also the use of premium brands in each technical discipline. Alejandro explained that their awareness of what can be achieved with continuity in the technical aspects has grown with experience, and they are now fully aware of how fundamental good lighting, sound and video is to creating the best performances. “I’m really satisfied with the fact that Robe products are the highest quality! They are also lightweight, fast and our engineers are happy with them. We are proud to be working with Robe in Mexico,” he concludes.